Congratulations to "Gale", the winner in Alexandrea's giveaway. Thank you to all who participated. For me, setting out to develop a romantic suspense series came more out of a love for the characters rather than a set intention. The goal of any story is to entertain, to captivate the reader and whisk them away to a world of another’s creation. As a writer I find stories spiced with romance and suspense to be the most fun to create, but it is always the characters that make any story fulfilling. My journey into this genre began when I wrote my first novel, To My Senses. After that book had been published, I envisioned a follow-up to it. Recovery, became the second novel in the Nicci Beauvoir series and where we are first introduced to Dallas August. Born out of my love for the characters, and my desire to highlight New Orleans and all that she had suffered during the ravages of Katrina, Recovery led to the third book in the series, Sacrifice. Even after the saga of Nicci and David was complete, I felt there was still more to be done with Dallas August. He is a character with a great deal of potential and his business of buying and selling secrets ignites the imagination. I never consciously decided to start out on a series, but I eventually let the story and the characters make that determination for me. As a writer, I think you know when a story has reached its conclusion and when there is more to be written. The same is true for Dallas August, and I have already completed the second book in The Secret Brokers series, Of Sins and Shadows, which will be released next year. And I know there will be more for him in future novels. I believe when you find a character compelling as a writer you wish to continue with his or her development. It is an intriguing process to see how far a character can go. And I believe the reader enjoys revisiting old characters in each installment of a series as well. Like any good life story, we want to find out what happens to characters in which we have become emotionally invested. It is like conversing with long lost friends and catching up on the trial and tribulations in their lives. We find common ground and comfort in the fact that their downfalls are ours as well, even if their secrets, affairs, intrigues, and schemes seem a little more glamorous than our own. In the end, it is this feeling of familiarity that is the biggest inspiration for creating a series. Like wrapping your body in a warm robe on a cold winter’s evening, curling up with a favorite character is appealing to most of us. What is dear to the heart gives one a sense of calm amid the chaos of our ever-changing lives. And finding a few moments of peace amid the hectic, technologically fast-paced, sometimes overwhelming world in which we live is necessary, if not required. It nourishes our souls and reminds us that true characters, even the ones made up on the page, matter to all of us. Intrigued? 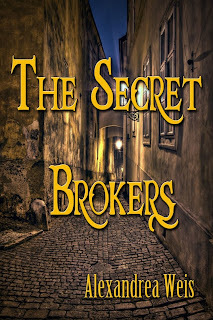 I will be giving away one print copy and one ebook copy of The Secret Brokers today, so you can have a chance to discover the world of Dallas August for yourself. Dallas rubbed his hand over the back of his neck and silently cursed. If Carl Bordonaro had ventured outside the safety of his New Orleans lair, then something big had to be up. His thoughts quickly turned to Nicci. Perhaps something had happened to her. He then shook off his apprehension. He knew she was safe with her husband, David Alexander. David would have contacted him before now if there had been a problem. He and David had been in touch constantly ever since he had returned to New York to take over Simon La Roy’s network of specialists. Burying himself in Simon’s business of buying and selling secrets had kept Dallas going over the last several months. It was only at night, alone in Simon’s king-sized bed, when the past caught up with him. His thoughts would always stray back to Nicci in the darkness. He missed reaching for her, touching her skin, and holding her slender body against his. That was the hardest part of loving someone—letting go. He sighed once more into the silence of his office, then squared his shoulders and headed for the door. Time to get back to work. When Dallas walked into the drawing room, he saw a short, round man in his early sixties, with a bald head and a pasty face, admiring Simon’s collection of ancient Greek vases. He was dressed in a tailored gray suit, wore thick, black-rimmed glasses, and seemed to sport a five o’clock shadow despite the early morning hour. “Loutrophoroi?” the man queried in a deep voice as he turned from the mahogony display cabinet. “Used for weddin’s and funerals in ancient Greece, I believe,” he said in his thick New Orleans accent. The man lifted his big brown eyes to Dallas. “Quite a collection the little guy had,” he added, seemingly amused. Born and raised in the tough Irish Channel of New Orleans, Carl Bordonaro had learned from an early age to embrace a life of crime in order to get ahead in the world. His underworld dealings had landed him on every FBI Most Wanted List for the past fifteen years. But like many Louisiana politicians, Carl Bordonaro seemed immune to federal indictment, having survived five arrests with no criminal convictions. Alexandrea Weis is an advanced practice registered nurse who was born and raised in New Orleans. Alexandrea began writing at the age of eight. She has been writing novels and screenplays for over thirty years. Her first novel, To My Senses (part I in the Nicci Beauvoir Series), was a finalist for commercial fiction in Eric Hofer Book Awards, a finalist for romance in the Foreword Magazine book of the Year awards, and a finalist for romance in the USA Book Awards. Her second novel in the series, Recovery, won the Gold Medal for best romantic suspense from The Reader’s Favorite Book Awards and was named best Romantic Suspense by the NABE Pinnacle Book Awards in 2011, as well as being a finalist in the ForeWord Book of the Year Awards for 2012. Book III in the Nicci Beauvoir series, Sacrifice, was published by World Castle Publishing in 2011 and has received critical praise. Her last novel, Broken Wings, combines her love of writing and rescuing wildlife, and was a winner of the NABE Pinnacle Book Awards in 2012. Alexandrea Weis is a permitted wildlife rehabber with the Louisiana Wildlife and Fisheries and when she is not writing, Ms. Weis is rescuing orphaned and injured wildlife. She lives outside of New Orleans with her husband and a menagerie of pets. Giveaway ends 11:59pm EST July 18th. Please supply your email in the post. You may use spaces or full text for security. (ex. jsmith at gmail dot com) If you do not wish to supply your email, or have trouble posting, please email maureen@justromanticsuspense.com with a subject title of JRS GIVEAWAY to be entered in the current giveaway. Print books are for US and CANADA mailing addresses only. This sounds like a wonderful series! I'd like a print copy if I should win. Thank you! Sounds great! I love romantic Suspense. would love to read and review at The Reading Cafe. Really enjoying your books, The Secret Brokers being the one I have not purchased. Would love a copy!!! Thank you for sharing with us... you have me really curious about this book... it sounds really interesting. I will have to look for this series. Nice post and excerpt. Sounds like a good book. Both series sound great - thanks for the post and giveaway. This book sounds soooo good. We're missionaries in Nicaragua & Mexico, happen to be in Nicaragua for the summer. I depend on the free downloads to keep me busy traveling the crazy busses! We'll be back in the states in Sept. Your books sound very intriguing! I would love to win a copy! Thanks for having this giveaway! I'm intrigue. The Secret Brokers sounds so mysteriously. Need to read more. This book sounds really good! I love to read anything set in or around New Orleans. I'd love to be entered to win this one. Thanks for the chance. I would be interested in reading this.